Persuasive essay sample: What it is better to be moral rather than immoral. There are many criminals that roam the earth for the benefit of themselves. There are also many hedonists that believe that everything done for the greatest pleasure is ultimately the purpose of life. However, I want to make the case today for morality over immortality. For this essay, I will consider morality according to Oxford Dictionaries: “Principles concerning the distinction between right and wrong or good and bad behaviour.” Though morality is a rather subjective subject, there are some principles that are universal across all cultures found by an Oxford University study: “help your family, help your group, return favours, be brave, defer to superiors, divide resources fairly, and respect others’ property” (“Seven Moral Rules Found All around the World”). The fact that these morals are found across 60 cultures from around the world demonstrates that morality, though subjective, is the cornerstone of keeping our societies together. Here are some reasons to be moral: without morality, a social life is almost impossible to maintain; having a good reputation and having a clear conscience is psychologically healthy; and most philosophies regard altruistic and principled behavior as important. There is no doubt that without morals, a society cannot function effectively. Chaos would rein. According to the Society of Morality, “We are social animals, and the actions we take — the things we do and the things we don’t do — have consequences on our environments and on the others around us. As a result, we need to be able to govern our behavior in the near term so as not to injure ourselves or our community in the long term. 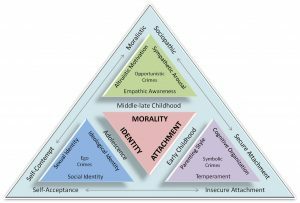 This system of controlling our actions and our thoughts in order to operate in a community is what we often refer to as morality” (Society of Morality). Therefore, we need a set of morals in order to operate within a social circle and a social environment. Acting immoral usually results in being excluded from social activities or being shunned by a society based on laws and cultural norms. Besides acting moral having a sociological need, it also has a psychological basis. Most people are concerned to some extent about their reputation. According to PsyPost, “A lot of economic models of human behavior assume that people are only rational when they narrowly pursue their own self-interest, but history shows us that people are also tremendously concerned with being and appearing moral” (Dolan, Eric W). So, the fear of one’s reputation being tarnished is often a strong motivator to be moral. And if someone has been immoral, most people go out of their way to make sure no one finds out, or to correct the behavior in order to not be caught. This goes in line with conscience as well. People generally feel in a better psychological state if they feel that their conscience is clean. A dirty conscience can result in a lack of sleep, anxiety, internal stress, and even illness. On the side of philosophy, the study of ethics comes into play. Most philosophers agree that one should rationally choose a set of standards of behavior in order to function. Though there is moral relativism, there are universal anthropological morals, as mentioned in the introduction. By the nature of our societies and cultures, we choose what we believe is right and wrong. But surprising, this rational behavior comes to a general consensus on morals. So, there is a fine line between moral relativism and moral absolutism. Morality is neither completely relative, and neither absolute (“Morality”). But the main thing to take away from this discussion is that philosophers generally believe that each individual has the right to rationally come up with a set of ethics to live by, and that it is healthy to do so. Being moral benefits us in many ways. Socially, it allows us to fit into groups better and to be in concord with others. Psychologically, acting moral keeps our reputation solid and maintains a clear conscience. Lastly, being moral is advocated by philosophy, which tells individuals to seek to carve one’s own sense of ethics to operate in this world and to understand oneself. Besides, it just feels better to be moral, overall. “Seven Moral Rules Found All around the World.” University of Oxford, www.ox.ac.uk/news/2019-02-11-seven-moral-rules-found-all-around-world. Dolan, Eric W. “People Are Profoundly Motivated to Maintain a Reputation as a Morally Good Person.” PsyPost, PsyPost, 9 Aug. 2017, www.psypost.org/2017/08/people-profoundly-motivated-maintain-reputation-morally-good-person-49435.